The boarding location of some Foothill Transit buses at El Monte Station will change this Monday, beginning at 5 a.m., due to a waterproofing project. The work is predicted to last two months, during which time the Upper Level at El Monte Station will be partially closed. As a result, the following Foothill Transit lines that normally board on the Upper Level of the station will board on the Lower Level through the month of June: 481, 486, 488, 492 and 494. Metro Silver Line, Foothill Transit Silver Streak, and Greyhound buses will continue to board on the Upper Level at El Monte Station. 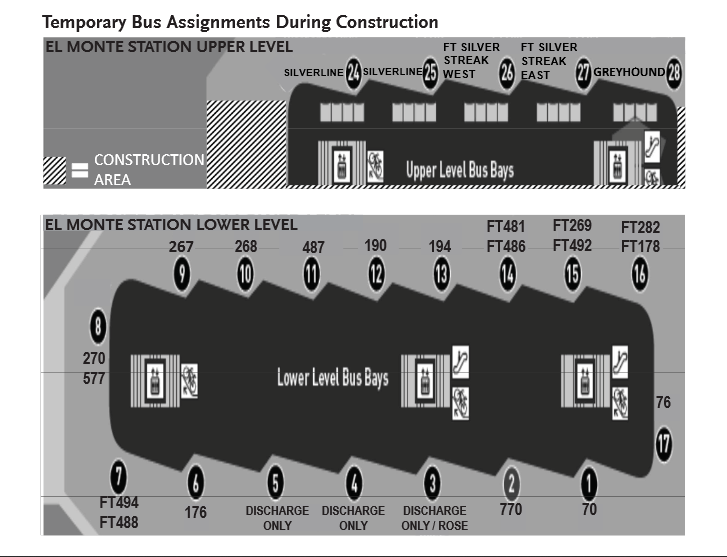 Please refer to the map below for temporary bus bay assignments during the construction period. As construction is a dynamic process, be sure to check back here at The Source for updates, or follow us on @metrolosangeles or @metrolaalerts for up-to-the-minute info. For more about the work planned for El Monte Station, here’s the construction notice. Is this waterproofing project the result of the lengthy El Monte station construction? If not, why wasn’t it done during the long project?